Highland County Auditor Bill Fawley studies data from Health Commissioner Jared Warner after Warner announced plans to place an 0.5-mill health department replacement levy on the ballot a second time. 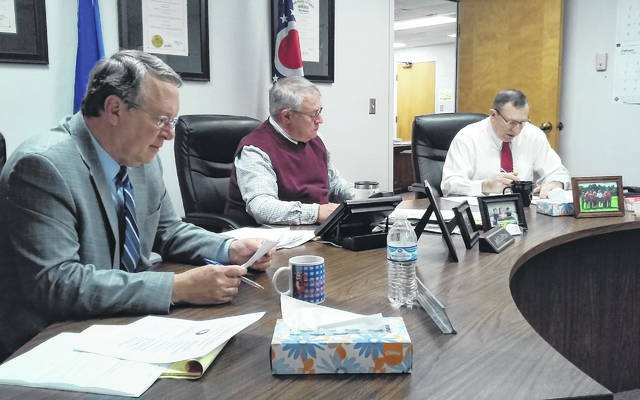 Highland County voters will decide on a replacement levy for the Highland County Health Department in this year’s primary election, pending county approval, with Health Commissioner Jared Warner saying the health department’s current levy funding is insufficient. The five-year, 0.5-mill replacement levy for the health department was narrowly defeated in the November general election by 98 votes. 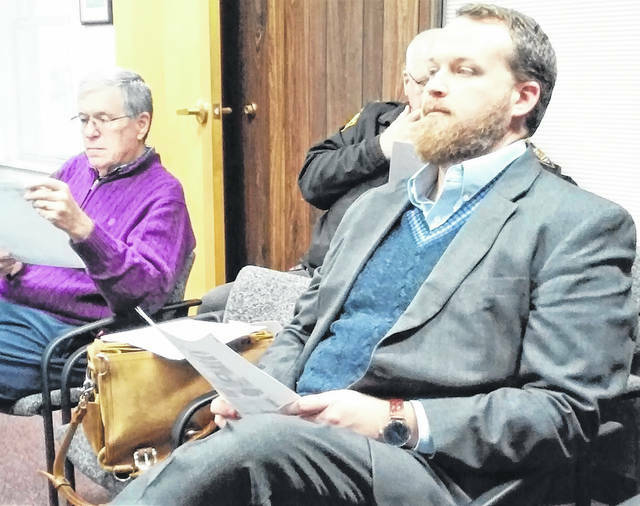 “The reality of it is, if we don’t pass this levy a lot of things that we are doing now that benefit the community we simply won’t be able to afford to do,” Warner said at Wednesday’s commissioners meeting. An additional reality, Warner said, is that without levy passage his department will not be able to fulfill state mandated activities. In data provided to both commissioners and The Times-Gazette, it was shown that the health department has been operating at a loss since 2013, with major expenses such as the cost of vaccines and contract services all increasing more than $20,000 in recent years. Health insurance alone surged upward to more than $30,000 in three years. He said health department funding comes from three main sources, one of which is local tax levies which account for 45 to 60 percent of operating revenue, and passage of the replacement levy would bring funding up to present-day levels. Passage of the replacement levy would cost the average property owner about 79 cents extra a month based on a valuation of $100,000, Warner said, which remains the smallest tax levy in Highland County. Also Wednesday, Doug Herling with Open Road Renewables gave commissioners a progress report on the status of the Willowbrook photovoltaic power station project, which is scheduled for construction in Concord and White Oak townships in southern Highland County. He said that more approvals have been received from American Electric Power pertaining to the station’s eventual connection to the power grid, and that Open Road is in the process of designing interconnection facilities. “We expect to have a full agreement in place on that interconnection to the grid sometime in May,” Herling said. In order to gain public input on the project, he confirmed the Ohio Power Siting Board will hold a public hearing at Bright Local Elementary School on Fair Ridge Road outside of Sugar Tree Ridge from 6-8 p.m. Tuesday Feb. 19. Geotechnical drilling is scheduled for next week in the area, Herling said, for the purpose of measuring solar irradiance. He told commissioners that despite the rapid progress being made in obtaining permits and licensures, he didn’t expect any construction work to begin on the Willowbrook solar farm until late next year. In other matters, commissioners approved 12 resolutions, eight of which were line item budget funding transfers, and Duncan accepted an appointment to the Solid Waste Management District Policy Committee. Four other resolutions dealt with out of county travel expense reimbursement for employees of Highland County Job & Family Services, authorized HCJFS to purchase equipment and software, agreed to re-appointments and new appointments to the Highland County Local Emergency Planning Board, and authorized a four-year lease purchase contract with Fyda Freightliner for the acquisition of two vehicles for the county engineers office.